comm.AWGNChannel adds white Gaussian noise to the input signal. 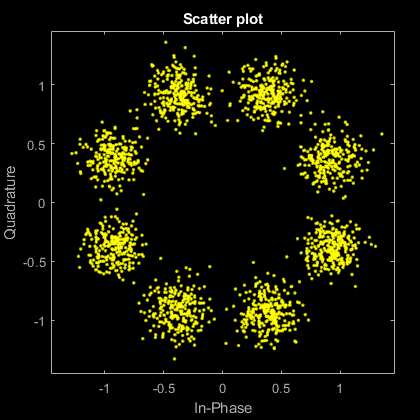 When applicable, if inputs to the object have a variable number of channels, the EbNo, EsNo, SNR, BitsPerSymbol, SignalPower, SamplesPerSymbol, and Variance properties must be scalars. Create the comm.AWGNChannel object and set its properties. 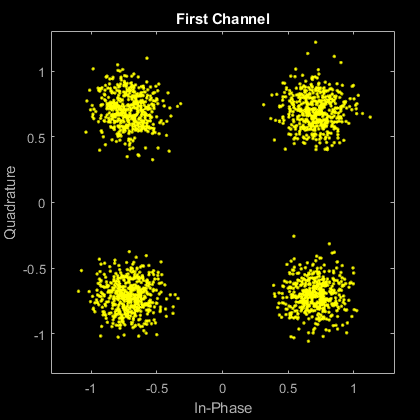 awgnchan = comm.AWGNChannel creates an additive white Gaussian noise (AWGN) channel System object™, awgnchan. This object then adds white Gaussian noise to a real or complex input signal. awgnchan = comm.AWGNChannel(Name,Value) creates a AWGN channel object, awgnchan, with the specified property Name set to the specified Value. You can specify additional name-value pair arguments in any order as (Name1,Value1,...,NameN,ValueN). Noise level method, specified as 'Signal to noise ratio (Eb/No)', 'Signal to noise ratio (Es/No)', 'Signal to noise ratio (SNR)', or 'Variance'. For more information, see Specifying the Variance Directly or Indirectly. Ratio of energy per bit to noise power spectral density (Eb/No) in decibels, specified as a scalar or 1-by-NC vector. NC is the number of channels. This property applies when NoiseMethod is set to 'Signal to noise ratio (Eb/No)'. Ratio of energy per symbol to noise power spectral density (Es/No) in decibels, specified as a scalar or 1-by-NC vector. NC is the number of channels. This property applies when NoiseMethod is set to 'Signal to noise ratio (Es/No)'. Ratio of signal power to noise power in decibels, specified as a scalar or 1-by-NC vector. NC is the number of channels. This property applies when NoiseMethod is set to 'Signal to noise ratio (SNR)'. Number of bits per symbol, specified as a positive integer. 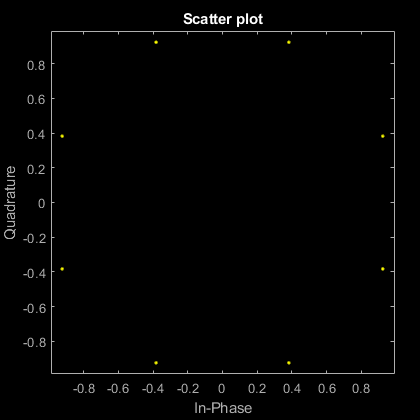 Input signal power in watts, specified as a positive scalar or 1-by-NC vector. NC is the number of channels. The object assumes a nominal impedance of 1 Ω. This property applies when NoiseMethod is set to 'Signal to noise ratio (Eb/No)', 'Signal to noise ratio (Es/No)', or 'Signal to noise ratio (SNR)'. Number of samples per symbol, specified as a positive integer or 1-by-NC vector. NC is the number of channels. This property applies when NoiseMethod is set to 'Signal to noise ratio (Eb/No)' or 'Signal to noise ratio (Es/No)'. Source of noise variance, specified as 'Property' or 'Input port'. Set VarianceSource to 'Property' to specify the noise variance value using the Variance property. Set VarianceSource to 'Input port' to specify the noise variance value using an input to the object, when you call it as a function. For more information, see Specifying the Variance Directly or Indirectly. This property applies when NoiseMethod is 'Variance'. 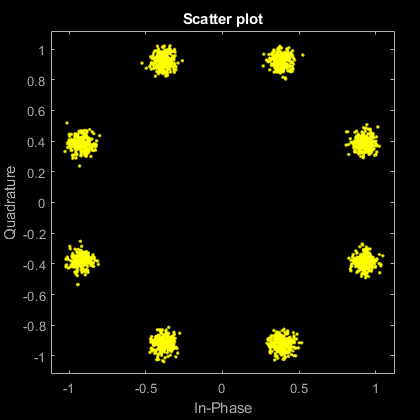 White Gaussian noise variance, specified as a positive scalar or 1-by-NC vector. NC is the number of channels. This property applies when NoiseMethod is set to 'Variance' and VarianceSource is set to 'Property'. Source of random number stream, specified as 'Global stream' or 'mt19937ar with seed'. When you set RandomStream to 'Global stream', the object uses the MATLAB® default random stream to generate random numbers. To generate reproducible numbers using this object, you can reset the MATLAB default random stream. For example reset(RandStream.getGlobalStream). For more information, see RandStream. When you set RandomStream to 'mt19937ar with seed', the object uses the mt19937ar algorithm for normally distributed random number generation. In this scenario, when you call the reset function, the object reinitializes the random number stream to the value of the Seed property. You can generate reproducible numbers by resetting the object. NS is the number of samples and NC is the number of channels. This property applies when NoiseMethod is set to 'Variance'. Initial seed of the mt19937ar random number stream, specified as a nonnegative integer. For each call to the reset function, the object reinitializes the mt19937ar random number stream to the Seed value. This property applies when RandomStream is set to 'mt19937ar with seed'. outsignal = awgnchan(insignal) adds white Gaussian noise, as specified by awgnchan, to the input signal. The result is returned in outsignal. 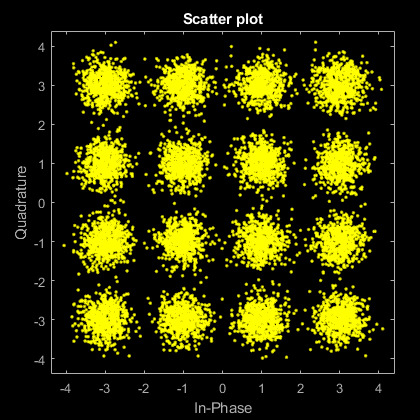 outsignal = awgnchan(insignal,var) specifies the variance of the white Gaussian noise. This syntax applies when you set the NoiseMethod to 'Variance' and VarianceSource to 'Input port'. Input signal, specified as a scalar, an NS-element vector, or an NS-by-NC matrix. NS is the number of samples and NC is the number of channels. 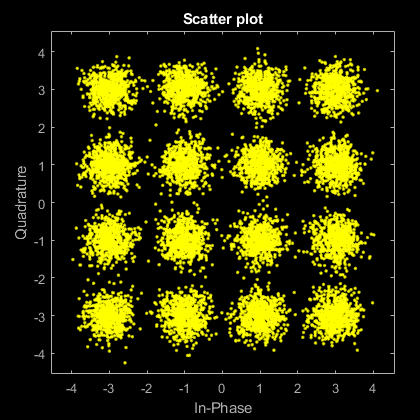 Variance of additive white Gaussian noise, specified as a positive scalar or 1-by-NC vector. NC is the number of channels, as determined by the number of columns in the input signal matrix. Output signal, returned with the same dimensions as insignal. Create an AWGN channel System object with the default configuration. Pass signal data through this channel. Create an AWGN channel object and signal data. Send the input signal through the channel. 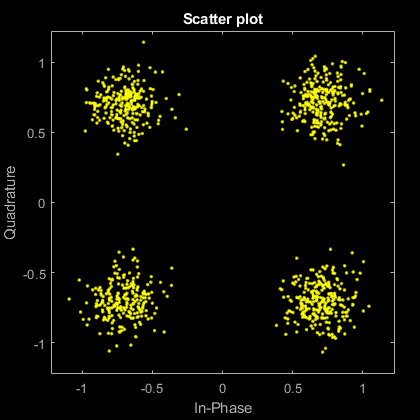 Modulate an 8-PSK signal, add white Gaussian noise, and plot the signal to observe the effects of noise. Create a PSK modulator System object™. The default modulation order for the PSK modulator object is 8. Add white Gaussian noise to the modulated signal by passing the signal through an AWGN channel. Transmit the signal through the AWGN channel. 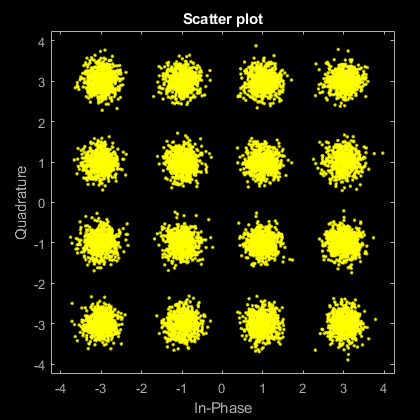 Plot the noiseless and noisy data using scatter plots to observe the effects of noise. Change the EbNo property to 10 dB to increase the noise. Pass the modulated data through the AWGN channel. Plot the channel output. You can see the effects of increased noise. Pass a single-channel and multichannel signal through an AWGN channel System object™. Create an AWGN channel System object with the Eb/No ratio set for a single channel input. In this case, the EbNo property is a scalar. 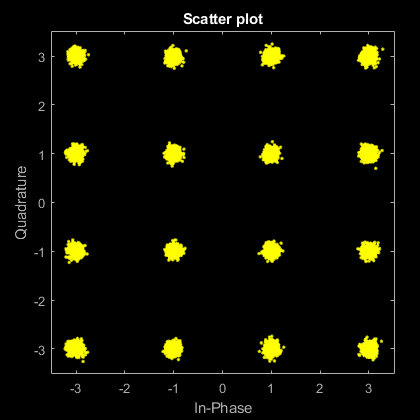 Generate random data and apply QPSK modulation. Generate two-channel input data and apply QPSK modulation. Plot the noisy constellations. Each channel is represented as a single column in rxSig. 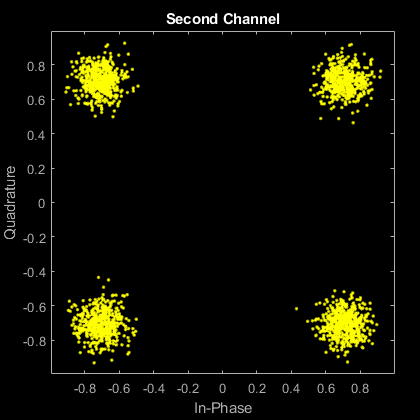 The plots are nearly identical, because the same Eb/No value is applied to both channels. Modify the AWGN channel object to apply a different Eb/No value to each channel. To apply different values, set the EbNo property to a 1-by-2 vector. When changing the dimension of the EbNo property, you must release the AWGN channel object. Pass the data through the AWGN channel. Plot the noisy constellations. The first channel has significantly more noise due to its lower Eb/No value. Apply the noise variance input as a scalar or a row vector, with a length equal to the number of channels of the current signal input. Create an AWGN channel System object™ with the NoiseMethod property set to 'Variance' and the VarianceSource property set to 'Input port'. Generate random data for two channels and apply 16-QAM modulation. Pass the modulated data through the AWGN channel. The AWGN channel object processes data from two channels. The variance input is a 1-by-2 vector. 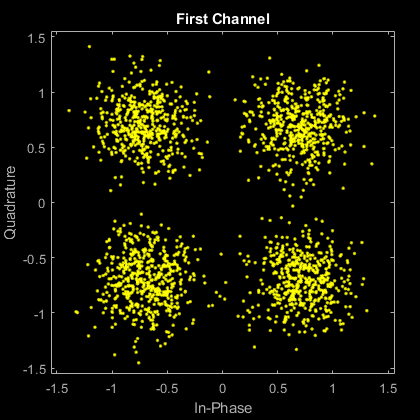 Plot the constellation diagrams for the two channels. 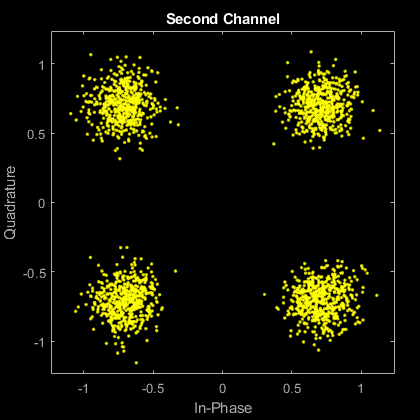 The second signal is noisier because its variance is ten times larger. Repeat the process where the noise variance input is a scalar. The same variance is applied to both channels. The constellation diagrams are nearly identical. Specify a seed to produce the same outputs when using a random stream in which you specify the seed. Create an AWGN channel System object™. Set the NoiseMethod property to 'Variance', the RandomStream property to 'mt19937ar with seed', and the Seed property to 99. Pass data through the AWGN channel. Pass another all-zeros vector through the channel. Because the seed changes between function calls, the output is different. Reset the AWGN channel object by calling the reset function. The random data stream is reset to the initial seed of 99. Pass the all-zeros vector through the AWGN channel. Confirm that the two signals are identical. Es represents the signal energy in joules. Eb represents the bit energy in joules. N0 represents the noise power spectral density in watts/Hz. Nsps represents the number of samples per symbol, SamplesPerSymbol. k represents the number of information bits per input symbol, BitsPerSymbol. All values of power assume a nominal impedance of 1 ohm. The equation for the real case differs from the corresponding equation for the complex case by a factor of 2. Specifically, the object uses a noise power spectral density of N0/2 watts/Hz for real input signals, versus N0 watts/Hz for complex signals. For more information, see AWGN Channel Noise Level. 'Property', then set NoiseMethod to 'Variance' and specify the variance with the Variance property. 'Input port' then specify the variance level for the object as an input with an input argument, var. Changing the number of samples per symbol (SamplesPerSymbol) affects the variance of the noise added per sample, which also causes a change in the final error rate. Select the number of samples per symbol based on what constitutes a symbol and the oversampling applied to it. For example, a symbol could have 3 bits and be oversampled by 4. For more information, see AWGN Channel Noise Level. Proakis, John G. Digital Communications. 4th Ed. McGraw-Hill, 2001.